Last weekend, I found myself in the garage unpacking and dusting off our old DVD player. I never threw it away, because, well, you just don’t throw away a working appliance. The joy to see the lights come on after plugging it in, was short-lived. Our new TV had different video input connectors, so I had to drive to the shops to find a new ‘old’ cable. After a bit of to-ing and fro-ing, I got it all hooked up, grabbed a bottle of wine, and, together with my wife, plucked the fruits of my hard labour. We watched Finding Nemo. Again. Even though we know the story back-to-front by now, we still want to see it – over and over again. It’s not just the spectacular animations; there’s much more that keeps drawing us in. And after asking some friends, I realised it’s not just us. Most of us can watch it multiple times and never find it boring. Which is not the case with the typical sales pitch I come across. In fact, with many of them, I tune out within minutes. Why is that? Why is it that I go through all that hassle to watch a children’s movie which doesn’t give me anything new, but I can’t get myself to listen to an average sales pitch? This warrants a deeper analysis. You give me a pitch like that, and I give you and audience that collectively grabs their phones to check their emails five minutes in. Maybe when you get to the demo bit do people sit up again, but by then, energy levels have dropped to that same point your iPhone seems to reach before lunch nowadays. The meeting ends with some vague agreement on next steps, with a level of commitment that can only be summarised as “meh”. One thing we can do to spice things up is to start with a personal story or anecdote. The idea is that the audience better connects when there is some unique or personal angle, and as a result would be more engaged throughout the rest of the presentation. While it could raise energy levels and participation in the first few minutes, an anecdote – however original – hardly ever is enough to carry the audience through the dreadful stages that follow. You need much more to get your audience to sit at the edge of their seats, absorbing every single thing you have to say. Finding Nemo accomplishes exactly that, so let’s see what we can learn from its story telling. I can’t possibly imagine you haven’t seen this movie, but still, let’s start with a brief refresher on the story line. Nemo lost his mum and as a result, Marlin, his dad, is very protective. He doesn’t want Nemo to stray too far – the ocean is a dangerous place – and raises him in the security of an anemone. As you’d expect from a kid, one day, Nemo does swim into the open water towards the edge of the reef. He sees a boat, and in an act of defiance, tries to touch it with his fin. He gets captured by a diver and ends up in a dentist’s fish tank in Sydney. Marlin goes on this big search to find Nemo, and when they eventually re-unite, the characters have learned some important life lessons. Never give up, trust the people who love you, appreciate what you have before it’s gone, and don’t be afraid of leaving your comfort zone, to name just a few. Clearly, a sales pitch is not in the business of evoking emotions around such morale. But that doesn’t mean we should disregard powerful story telling. Finding Nemo teaches us three things around how to draw in an audience. First, the story has a fair bit of tension, especially for a kids movie. It’s not all positive. As with most stories of fiction, the first act is rather happy and good, but then – after Nemo gets captured – scene after scene of challenging events follow. There are sharks, exploding mines, stinging jelly fish, hungry seagulls, and of course, Darla, the dentist’s niece. Thanks to Marlin’s persistence and the teamwork of the other sea creatures he meets along the way, there’s a happy ending. The story goes up and down from positive to negative which leads to tension – and it’s this tension that captivates the audience. It wants to find out how the characters overcome the challenges they face. Sales pitches tend to miss that. They paint a picture of pure positivity, and that’s not only boring, it makes the audience instinctively question its credibility. Because in real life, it is not all rainbows and butterflies. Secondly, we recognise ourselves in these characters. Their struggles resonate with us. At the start of the movie, Marlin is overprotective, scared and insecure, but he comes out stronger and with more confidence. Nemo is curious, loyal, and despite his handicapped fin, pretty brave. Other than being absent minded, Dory is also very honest, and optimistic. We can find ourselves in these traits, and as a result, we become emotionally tied to the characters, and, hence, the story. We want the characters to win, to come out as the heroes, because we are just like them. The problem with most sales pitches is that they try to make the vendor the hero. Worse, it’s all about the vendor. The reality is that your potential client doesn’t care about you winning. They care about themselves. The vendor should never be the hero in a presentation. The client should be. Thirdly, the movie’s key conclusion is around those moral lessons. Nemo, Marlin, and Dory had to go through this ordeal, so that they could gain these insights. Watching a Pixar movie as a grownup, we know we’re going to be treated to these underlying life messages that are crafted for us, not just kids. We’re going to learn something. From the very first minute, the movie is set up like that. It sets the scene that overprotection isn’t good, and even though we don’t know how the story is going to unfold, we unconsciously have buckled up for the journey to get to the moral lessons, e.g. the purpose of the story. We’re not just watching because of the amazing animations and funny characters, we also want to be taken on a journey towards this ‘why’ behind the story. Sure, conveying messages of morality is not the typical goal of a sales pitch, but we still need to be clear on the purpose. As Simon Sinek says, we need to start with why. Too often, sales presentations skip this part and go straight into the what, missing out on the opportunity to connect with the audience on a deeper level. Start your pitch not with what you do, but why. Confirm that you understand the client’s world by showing them how it’s been changing (for example, “consumers are getting more demanding”). Then, articulate how that change is creating tension or challenges for the client (“because the business systems and processes in place are based on consumer expectations from the past”). Then, show how this tension leads to business problems (“consumers might leave you for more agile competitors who can meet their needs”) and urgency (“as a result you could see your revenue drop”). Build this tension and build on the why as long as you can, because once you get in the weeds of the what, it’s really difficult to elevate back to pains and solutions at a business level. And if a potential client isn’t convinced on the why, they’re never going to be convinced that they need your what. 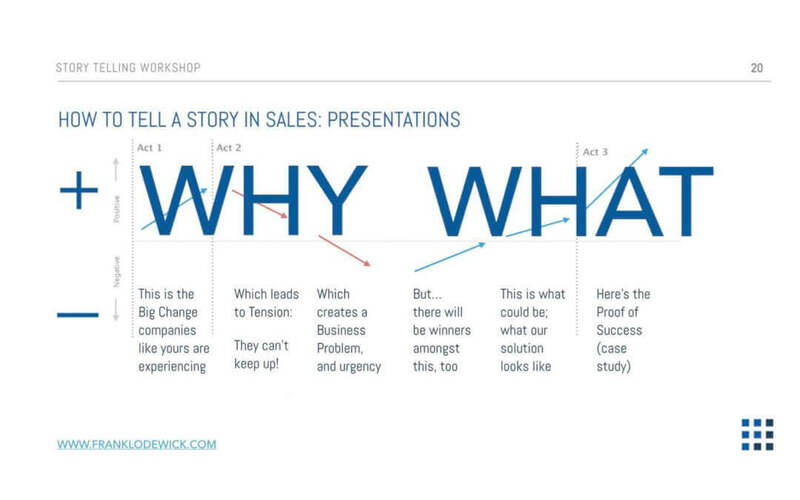 (Note that this emphasis on the why reduces during the progression in the sales cycle; when you get towards your final presentation, your client should have bought into the why. A mere summary would suffice, before you go into great detail demonstrating the what). Then, switch the tension and take them on the journey towards what could be. Explain how your solution addresses the business problems you described before, without going into too much detail on specific features and functions (“you can’t fix this fundamentally flawed architecture with old school systems and processes; you need a new, data-driven way that’s fully automated. We’ve come up with a solution to help you just that”). Finally, show how you’ve helped other clients overcome similar challenges, and show the positive results they achieved. Don’t just show logos, but put in statements from three or four clients which articulate the journey from business pain to great results. These are the independent proof points that show how great you are, but with a much more credible “don’t take it from me” angle. Ensure these proof points are articulated in the language of the client, so that they can recognise themselves in the hero of that sub-plot, a client just like them. Crafting good pitches isn’t easy, and will take a lot of practice. ‘Dancing’ with the tension can be particularly tricky for reps who don’t like uncomfortable conversations. However, you will need to build the confidence to go there. It will help you elevate your pitch, and be seen as a trusted advisor. To learn more about this captivating skill, watch how Nancy Duarte finds these structures in speeches of great narrators like Steve Jobs. Sure, you will make mistakes along the journey, but don’t give up. It’s like Dory says: “When life gets you down, you know what you gotta do? Just keep swimming. Just keep swimming”.